Ravaged by injury and illness the Under 11 boys travelled down to Brighton to play in the 3rd Pelican Cup. It is always going to be a tough day when you are 3 players short but fair play to the boys for sticking at it in what was untraditional 7’s weather! Things were made even more difficult as Luke was next to be struck down, which left 7 boys to play out the remainder of the matches with no chance for a breather. New Beacon, the current champions, St Christopher’s, Eaton House and Handcross Park provided our opposition for the day. Over the course of the afternoon it wasn’t a lack of ability that cost us a higher placing but more on the onset of fatigue! We scored some great tries through Shams and Nicholas, Ewan opened his account for the season and Ben S grabbed a brace on debut for the A’s. The frustrating thing was knowing that we could have been challenging for the top honours had we been at full strength and seeing a Pennthorpe side, who we had beaten 10-3 only last month, claim one of the top awards left us thinking what could have been. All in all it was an enjoyable and valuable experience for the boys. 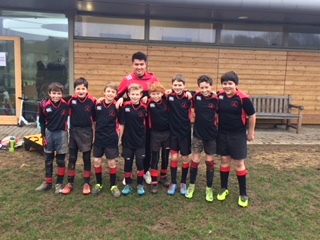 Spirits were never dampened, despite the weather, and the boys also got to meet Marcus Smith who is the current Harlequins fly half, part of the England squad and former old boy of Brighton College. If you don’t know much about this player then I suggest you keep an eye out for his name because he is a real talent with a promising future. Well done boys, you did us proud.